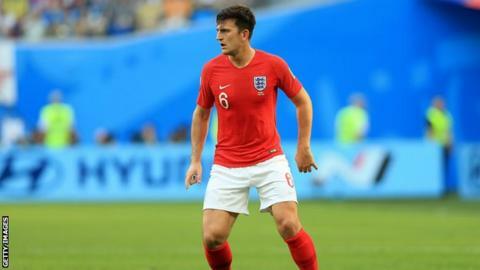 Leicester City will resist any move from Manchester United for defender Harry Maguire, and instead hope to tie him to a new deal. The centre-back, 25, played a key role in England's progression to the World Cup semi-finals this summer, starting every game in the knockout stage. He played every Premier League minute for the Foxes last season after a £17m move from Championship side Hull City. Maguire has been linked with a £65m transfer to Old Trafford. United manager Jose Mourinho is keen to sign a central defender and is a known admirer of Maguire after his standout performances in Russia. Leicester have proved tough negotiators in the past. They managed to resist approaches for Riyad Mahrez last year and Manchester City's attempt to sign him in January, before consenting to the Algerian winger moving for £60m this summer. And with the transfer deadline on 9 August this season, the Foxes are privately making their position on Maguire clear. United have so far signed three players this summer - Brazil midfielder Fred for £47m, Portuguese defender Diogo Dalot and third-choice goalkeeper Lee Grant. Dalot, signed from Porto for £19m, will not feature until September as the 19-year-old recovers from a knee injury.